Wi-Fi 6 is based on 802.11ax and is the next step in Wi-Fi network efficiency. However, with the Internet of Things (IoT) leading to developing more and more devices, Wi-Fi access points (APs) won’t matter much if the Wi-Fi network cannot support all of these devices. For this reason, the purpose of Wi-Fi 6 is to work smarter and allow for better Wi-Fi performance. 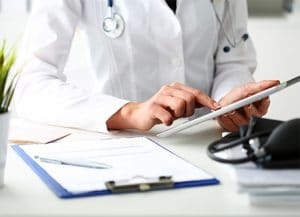 This better performance has great benefits for all Wi-Fi device users, and this article specifically targets the benefits in the healthcare industry. This feature improves network efficiency and overall capacity. A larger amount of support increases the number of MU-MIMO clients that APs can communicate with simultaneously. High-bandwidth applications can particularly benefit from this. Orthogonal frequency-division multiple access, or OFDMA, allows a single packet to serve numerous clients, reducing transmission latency. Wi-Fi 6 uses 1024-QAM, which allows devices to send more data per packet. Previous specifications used 512-QAM and 256-QAM. Wi-Fi 6 is backwards compatible. It works with 802.11a/b/g/n/ac. Target wake time is a feature that brings a better way to handle packets. Targeting wake time significantly increases a device’s sleep time and improves battery life. With target wake time, devices can remain asleep for more extended periods and only wake up when necessary. This feature benefits battery-powered devices, which becomes helpful in healthcare for devices like patient monitors, infusion pumps, respiratory equipment, and sensors. Hospitals are often congested places. They also utilize many Wi-Fi devices per person, which means that they are the perfect environments to tap into the benefits of WiFi 6 performance. Wi-Fi 6 focuses on the whole situation and on improving the overall relationship between a hospital and wireless experience for all Wi-Fi devices. Negotiate and define a specific time to send data, which reduces contention and overlap between users. Use OFDMA to allow up to 30 other devices to share a channel with the one infusion pump, rather than having to take turns. Overall, Wi-Fi 6 medical devices will work better, stay connected better, and be more reliable. As a result, this innovative connectivity in the real world means one thing: better patient care.